What types of castor are there, and how do I fit them? There are two main castor fittings that you’ll see in most day-to-day situations, and each one has benefits based on individual requirements and the environment they’ll be used in. Generally, though, the type of castor fitting you’ll choose will depend on where it’s going to be used and the type of job it has to do. The two main types of castor fitting are “plate” and “threaded stem”. You’ll mostly see these types of fittings around the home because they’re just so versatile. They’re used to provide mobility to many household items such as sofas, cupboards and TV stands to name just a few, and because of this, they’re probably not used that much. Unless, of course, you’re the type of person who constantly likes to rearrange the furniture! The real benefit of these types of castor is that they are easy to replace. If, during one of your mammoth rearranging sessions, you crack the wheel or manage to break the castor entirely, you can replace them quickly and easily. Where they’re not so useful is areas where there’s maybe a lot of dirt and debris on the floor which could easily clog the castor. Although, a guard can be fitted in some places where the benefits of this type of castor outweigh the downsides. Top plate castors are fitted to the object via screws to the object that requires them. In most cases this will be via screws or bolts, but if a real solid fix is needed the plate can be welded to the host object. 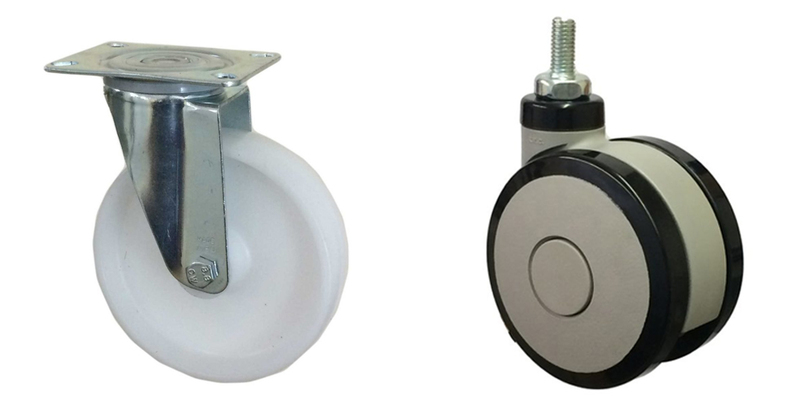 Because of the size of the plate and the method of fixing, the main benefit of top plate castors is the stability they provide. They’re also extremely durable, although they do come with a downside in that they’re a bit more difficult to replace should they break. So, what type of castor fitting should I choose? You’ve probably already got a good idea of what type you’re going to choose, but if you need any advice, you should really give QED a call today, or fill out our enquiry form and we’ll get back to you ASAP.